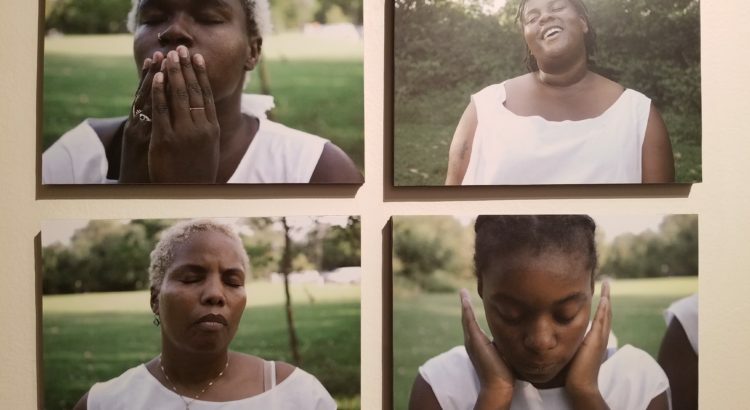 Monday night the Institute for Research on Women and Gender welcomed Nastassja Swift and her exhibit she was here, once as part of their Narrating Black Girls’ Lives Conference series. Over three days they hosted speakers and other events, including a wool art workshop, focusing on the stories of Black women’s lives. The opening of the she was here, once exhibit took place in the Lane Hall entrance, utilizing the space as an unconventional gallery. The exhibit was not large, it featured a half dozen photos down two hallways, short films looping on two screens, and three large masks hanging above our heads. The exhibit opening was small; everyone who was there knew someone there and was clearly comfortable in the space. This art exhibit is based on a performance art piece. The performance was a journey of three and a half miles for eight African women in Richmond, Virginia. These women traveled from the port on the James river, past the old auction blocks, and finally into a majority Black neighborhood. Throughout their journey, the women, ranging in age from teen-aged to mid-40s, stopped along the way to dance and sing. Swift was inspired to create this piece after learning about the historical significance of the city she had spent so much time in. I looked at the photographs first. I was struck by the last four photos I looked at (below) featuring some of the performers without their masks on, one of the few chances to see their faces. The photographs featured such raw, beautiful emotion and their placement in a quadrant of four panels made it even more striking. Next, I took in the masks. The performers wore larger-than-life, white, wool masks for the majority of their journey. Three of these masks were featured in the exhibit hanging above us as almost caricatures of stereotypical African features. Finally, I watched the two short films documenting the performance art piece and the creative process. As I moved throughout the space the sound of the women singing in the videos was omnipresent, creating an ambiance in the space and a moving experience.